The Lok Satta Party is ready to consider “strategic alliances and tactical adjustments” with other parties without compromising on its core values. It rules out the Congress but names the Bharatiya Janata Party specifically as a potential partner. 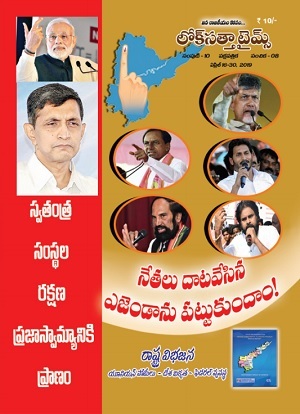 Lok Satta’s own experience in Andhra Pradesh since its inception in 2006 and national imperatives call for such a strategy at the present juncture, its founder and national President Dr. Jayaprakash Narayan tells his party members in an open letter. In the letter released to media today, Dr. JP dwells on the party’s performance in Andhra Pradesh and the lessons to be learnt from it. Against such a backdrop, “it is excruciatingly difficult to translate in the short-term our support base into a legislative mandate. A people plagued by the fear of wasted vote and potential leaders immobilized by the perception of winnability self-fulfil their prophecy”. Dr. JP says that for the Lok Satta wedded to all-round reforms and alleviating dire and soul crunching poverty, rampant exploitation and denial of human rights and creating opportunities for education, healthcare and employment, there is no alternative to working with others. There are no easy answers or quick fixes to our political and governance crisis. Dr. JP recounts that the Lok Satta is largely instrumental in ushering in a number of electoral reforms. They include disclosure of candidates’ criminal antecedents, improvement in voter registration, political funding law, strengthening the anti-defection provisions and limiting the size of the Cabinet. It is again largely responsible for the Right to Information Act, and laws relating to constitution of the Lokpal, local courts and ensuring autonomy for cooperatives. Lok Satta’s proposals for laws on judicial standards and accountability, National Judicial Appointments Commission and service guarantee for citizens are in the pipeline. Dr. JP recalls that the Lok Satta extended a hand to AAP as its first choice but it, being wedded to a monopolistic regime, spurned it. 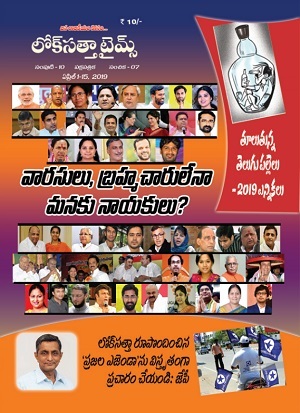 Against such a backdrop, the Loksatta has to make a choice between the Congress and the BJP , the two middle- of-the-road parties based on four yardsticks -- pursuit of dynastic politics, dependence on money power, belief in freebie culture and promotion of sectarianism.